“This historic investment in walking, biking, & transit puts [Oregon] on the map as a leader in accessibility & active transportation. It’s no small task that Oregon legislators passed a $5.3 billion transportation package last week. We haven’t had a new way to fund transportation projects and programs since the Jobs and Transportation Act passed in 2009 and this year’s bill was nearly dead just days before being resurrected thanks to a few major compromises. But a small part of House Bill 2017 — a $15 tax on new bicycles — has gotten a lot of attention from transportation reformers (did you see the tweet from former New York City DOT Director Janette Sadik Khan?!). And for good reason. The tax an unprecedented step in the wrong direction from a state previously famous for passing the forward-thinking “Bicycle Bill” way back in 1971. And while our debates and discussions about the bike tax will continue, let’s not forget the other major components of this bill. After all, there had to be something good in the bill for The Street Trust and other progressive nonprofit groups to support it. So… What exactly did they come away with? Here’s how transit, biking, and walking fared. Powell Blvd got a major funding boost in the bill, but it’s biggest advocate inexplicably voted no. Oregon’s statewide transportation bill is on its way to Governor Kate Brown’s desk. With support from boths sides of the aisle it passed the House yesterday 39-20 and passed the Senate today 22-7. House Bill 2017 was on the rocks just weeks before its passage; but that was before lawmakers hashed out major compromises. 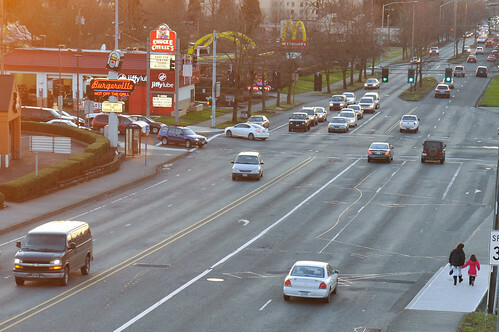 The initial proposal would have raised over $8 billion dollars — including about $777 million for four freeway widening projects in the Portland metro region. Funding for those projects would have come from a new local gas tax and increased registration fees. 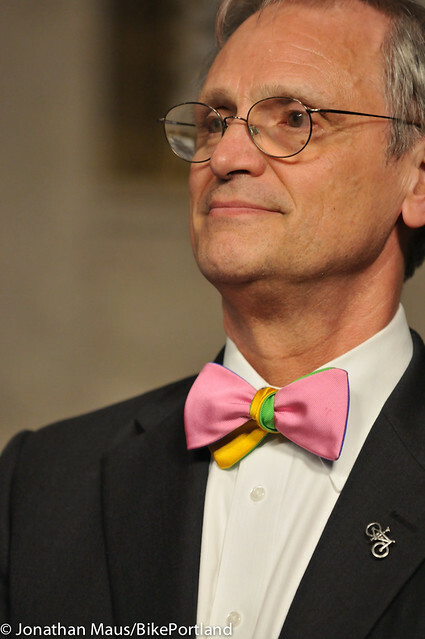 Those fees and taxes brought auto lobbyist groups out of the woodwork in opposition. With the threat of referral to voters, lawmakers slashed the funding for those highway projects, reduced the size of tax increases, and ultimately shrank the bill’s overall revenue by about $3 billion (they also got environmental groups and Republicans to agree to changes in the low carbon fuels program). The amended bill will raise $5.2 billion over 10 years. And while the big-ticket highway project earmarks — including I-5 expansion at the Rose Quarter — went way down, the revenue share for public transit, biking and walking remained intact. Among other things, the bill will provide: $103 million a year to transit agencies to improve bus service via a 0.1% employee-paid tax on wages; $125 million for Safe Routes to School via a 40% matching grant program; and an estimated seven million per year (exact amount will fluctuate) dedicated to paved paths and multi-use trails via a combination of sources including a $15 bike tax. The boost in gas tax revenue will also help pay for road projects that will include a minimum of 1 percent investment in biking and walking-related upgrades thanks to Oregon’s “Bike Bill”. Read it and weep. Or rejoice, if you think it’s a great idea. 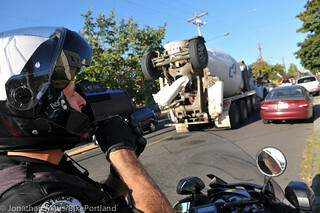 With passage in the Senate today, Oregon’s transportation bill is headed to the Governor’s desk for signing. We’ve got lots more coverage planned, but there’s one thing that I felt should be singled out. Take a deep breath and consider this: Oregon is now the only state in America with a bicycle excise tax. Three bills signed by Oregon Governor Kate Brown this week will enact new regulations on motor vehicle use. Two of the bills focus on speeding and one aims to get justice for victims of negligent automobile use. 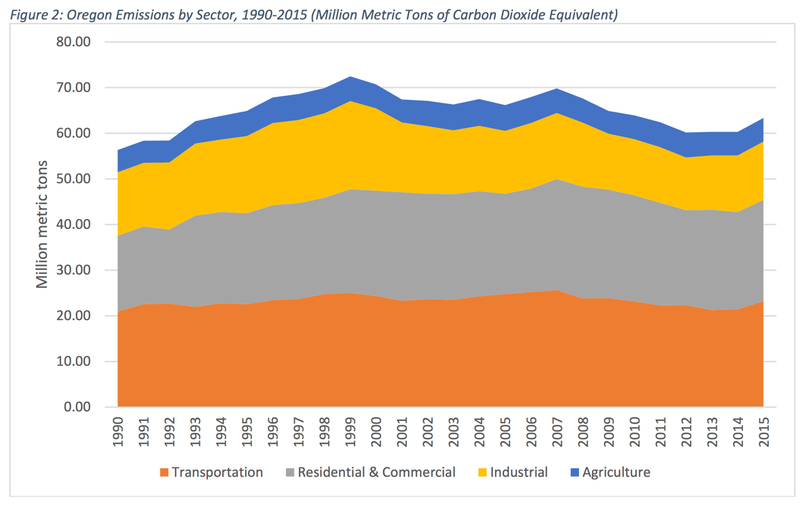 The transportation sector is the largest source of greenhouse gas emissions in Oregon. The news this week was full of stories about how Oregon Governor Kate Brown and Portland Mayor Ted Wheeler were beside themselves about President Trump pulling the U.S. out of the Paris climate agreement. They vowed to remain committed to climate change prevention. Yet both of our local leaders support spending hundreds of millions of dollars on the single largest source of greenhouse gases in Oregon: emissions from cars and trucks. Rail advocate Dan McFarling testifying in Salem on Monday. One of the best ideas for improving transportation in Oregon is glaringly absent from the state’s transportation funding package: Better passenger and freight rail lines between Portland and Eugene. At one of four hearings on House Bill 2017-3 held at the State Capitol this week, representatives from the Association of Oregon and Rail Transit Advocates took the opportunity to remind lawmakers about this fact. 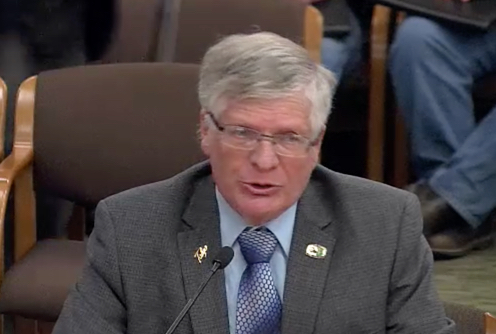 While the package being debated includes over $900 million in earmarks for highway expansions in the name of “congestion relief,” advocates with AORTA feel like the bill will cause Oregon to fall even further behind our west coast neighbors. 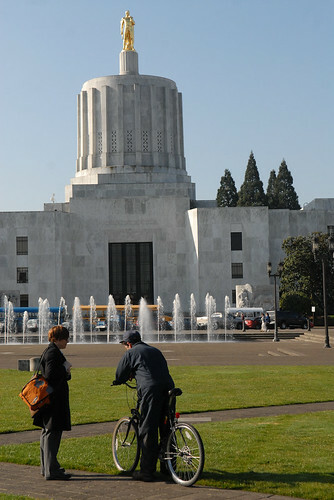 Among a host of tweaks expected to Oregon’s transportation funding package is very likely to include a major change to the controversial bicycle excise tax. Instead of 3 percent excise tax on all new bikes (with some exceptions), it’s likely to become a $15 flat fee. 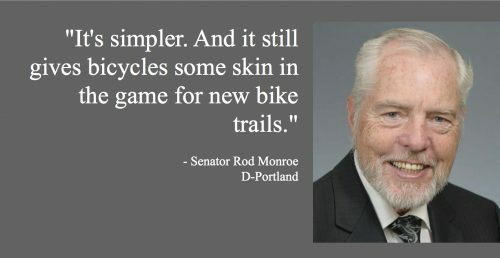 In a meeting of the Joint Transportation Preservation and Modernization Committee at the capitol last night, Co-Chair Lee Beyer (D-Springfield) said he and other legislators have heard concerns about the tax from bicycle dealers. As we reported last week, the current proposal is a 3 percent tax on the purchase of new bicycles. That idea faced strong opposition from shop owners who fear the tax will drive sales toward online and big-box retailers, create onerous new reporting requirements, and put a black cloud over bicycling in Oregon. This post was written by The Street Trust’s Interim Executive Director Stephanie Noll and Campaign Manager LeeAnne Fergason. On Tuesday and Wednesday, five amazing kids testified in Salem before the Joint Committee on Transportation Preservation and Modernization. These young advocates had never before been to the Capitol. 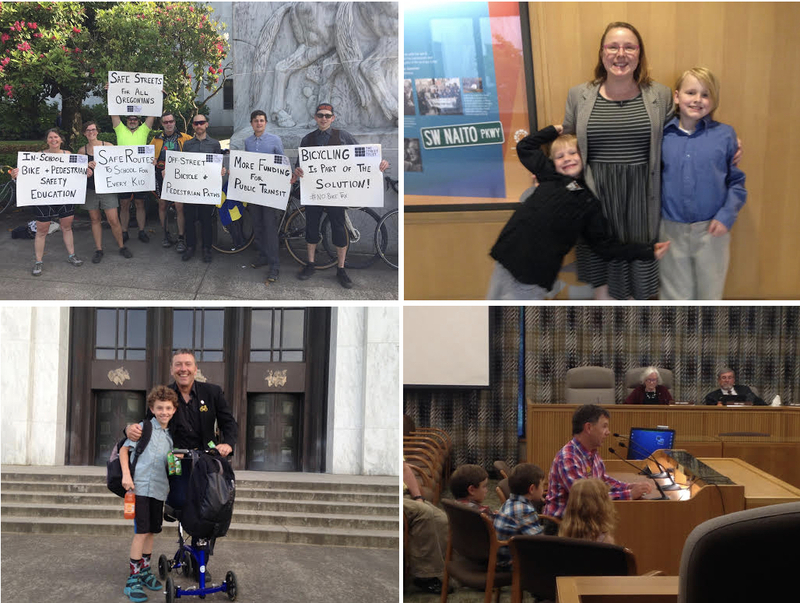 Legislators welcomed Oliver from North Portland; Ben, Gus, and Isadora from Eugene; and Trey from Milwaukie as they and their parents spoke out for Safe Routes to School.